Plastic Pump Bottles – An Environmental Scourge! – ScienceMan! Plastic Pump Bottles – An Environmental Scourge! OK, I admit it, I’m a bit of a “tree-hugger”, and that means I re-use and recycle pretty religiously. So take my following comments with a grain of salt! Now for some products, it might be a net benefit – for example, the liquid soap dispenser in the pictured product actually stretches the product – when dispensed as a foam, the soap actually lasts much longer, thereby lowering consumption. BUT… wouldn’t it be nice if they sold REFILL bottles of this product? They are nowhere to be found! QUICK TIP for the science teachers! These “Method” plastic bottles make great flasks! Of course you can’t heat them, but the wide bottom makes them very stable, and being wide-mouthed and see-through makes them useful for all sorts of experiments. Don’t forget to recycle them when you’re done with them! But what’s worse, is that the pump is complete ineffective at getting the last of the product out from the bottom of the bottle. Of course, they don’t make refills, either! The following picture shows I was able to extract 28 mls of product from a 480 ml bottle, after it became completely impossible to pump it out. That’s 6% of the product that would otherwise go into the trash! Imagine the millions of litres of these products are wasted each year in North America, simply because of ineffective, wasteful plastic pumps. 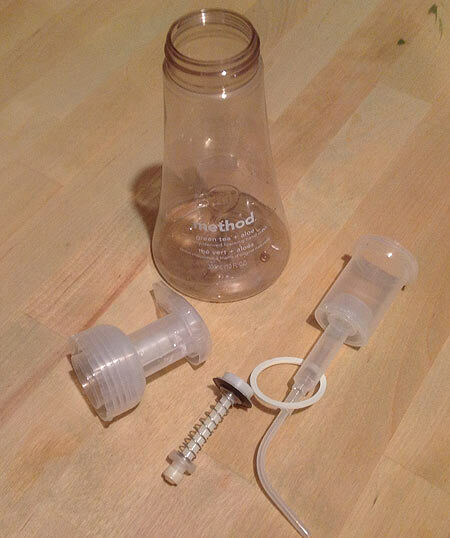 And yes… I use plastic syringes to collect and dispense the remainder from bottles where the last bit is difficult to extract – I told you I was a tree hugger! Project Adult Literacy Society – A Very Noble Cause! Solar Panels Dangerous? Or Power Industry Propaganda? 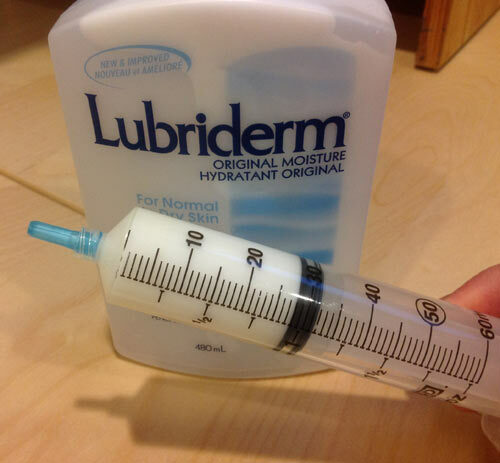 I love these pump bottles and make my own refills. I can refill mine about 5 times from one standard soap bottle (80% saving). You may have to play around with the soap to water balance for your own personal preference, but I mix approx 1 part soap to 5 parts water. I don’t shake the bottle to mix, I tip back and forth and leave the mixture to disperse (dense soap would block up the foaming mechanics) so I don’t use it immediately as the dense soap would settle at the bottom. Before using the pump I would check the soap has dispersed evenly and tip back and forth on its side, normally I don’t find I need to remix after this, but some liquid soaps respond differently. VERY IMPORTANT not to use any soaps with moisturisers in it…they stop the bottle pump from raising naturally, so I normally stick with the see-through soaps. Hope you find this useful, my favourite part is that you can dispense the soap and clean without wetting first (another saver). 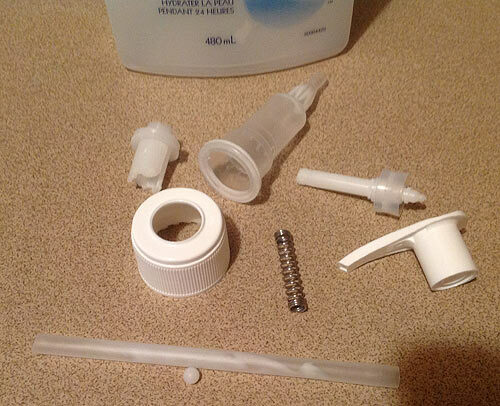 Hey, i have this regular soap pump with me but i cant separate all the parts.. how do you separate all the parts that easily? ?